This weekend, thousands of Ohio State students came together at BuckeyeThon’s annual Dance Marathon to celebrate a year’s worth of fundraising for the Hematology, Oncology, and BMT Unit at Nationwide Children’s Hospital. At the end of the event, they announced that $1,603,437,49 was raised For The Kids!! 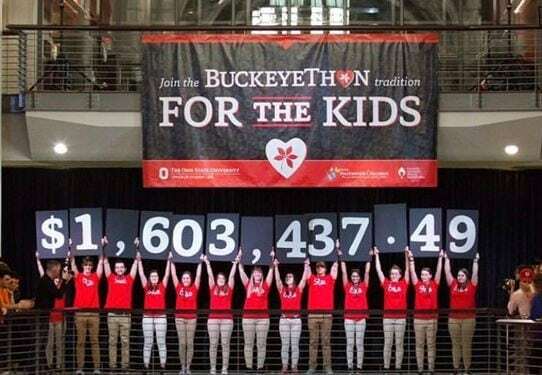 Thank you so much to BuckeyeThon, The Ohio State University, the Office of Student Life at The Ohio State University, and each and every donor for your ongoing support of the kids and families at Nationwide Children’s. We are beyond grateful for your dedication and commitment to saving lives. Previous post: Meet Patient Champion Olivia!